When it comes to prints, floral never seems to go out of style, so for this week’s Fabulous Find, we found a floral skater skirt that is both trendy and budget-friendly. The dark floral print is ideal for the colder months of the year, while the flouncy cut has a youthful, on-trend feel. This skirt is a fantastic base for trying out the mixed prints trend. In this case, a striped boatneck tee complements the floral print perfectly. Suede oxfords keep things casual, while a rust red draped blazer adds a pretty pop of color. Lastly, accessorize with a pair of dark red studs and a cool double chain ring. For another cute yet casual ensemble, pair our Fab Find with a cozy cable knit sweater. Riding boots add some polish, while black tights streamline the outfit. 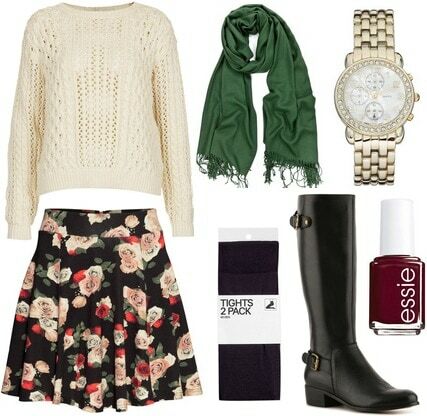 Pick up on the green hues in the skirt with a matching scarf, then accessorize with a menswear-inspired watch. Complete the look by painting your nails a moody and autumnal wine red shade. Our final look is this dressiest of the bunch, and has a cool downtown vibe that would work well for a night out. Pull from the colors found on the skirt and pair a blush pink bow blouse with some dark red platform pumps. This bouclé jacket adds both texture and interest to the ensemble, as do these subtle yet chic sheer dotted tights. For the finishing touch, accessorize with a pair of opulent opal drop earrings. What do you think of this week’s Fabulous Find? Would you buy this skirt from H&M? Which look is your favorite? 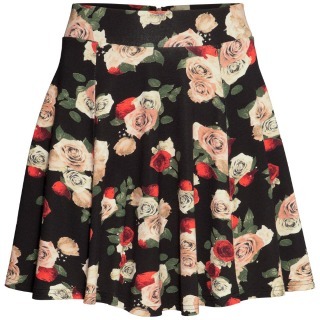 How would you wear a floral skater skirt? Remember to leave a comment below and tell us what you think!